As many of you know we spent the days leading up to Christmas in Nationwide Children's Hospital for Knox's second open heart surgery. We checked in for surgery on December 19th and thanks to our amazing surgeon Dr. Galantowicz we were released on Christmas day. 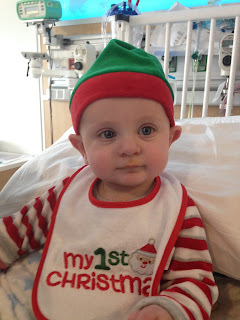 With it being Knox's first Christmas, I was bummed that we were spending it inside the hospital walls, but the success of his surgery and his recovery was a beautiful Christmas gift. 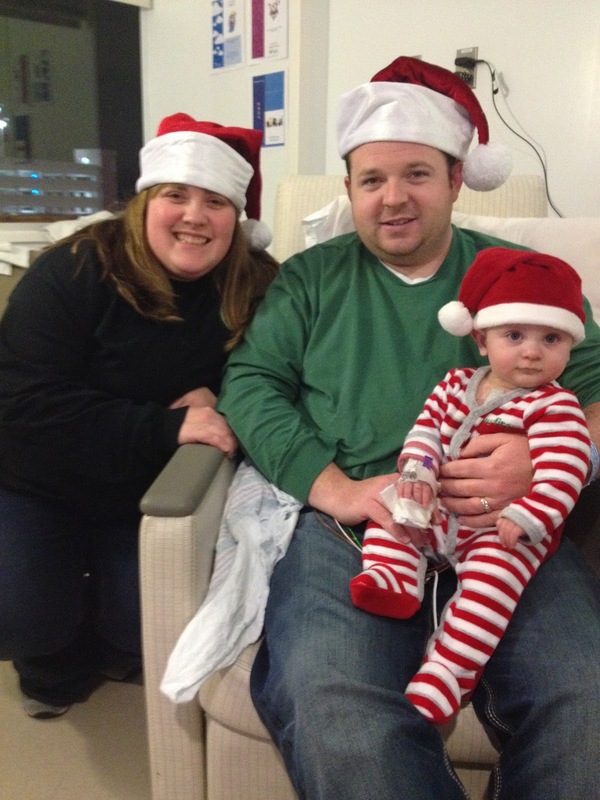 No matter what your child's illness is being in the hospital around the holidays is hard. Nationwide did a wonderful job providing gifts, decorations, and Christmas cheer to those in the hospital. Santa even snuck in while we were sleeping and left Knox a gift. Not knowing how long we were going to be in the hospital I brought a Christmas tree, our stockings, Christmas jambes, and a few gifts for Knox in case we were in over the holiday. My dad went across the street to the CVS and bought us all hats so that we could start a Christmas tradition. It was a very humbling and intimidate time to be together, and be thankful for our Christmas blessings. With the holiday season right around the corner, I can't help but think about our time in the hospital, and the families who will be there this year. To honor Knox's successful heart surgery and to do something for Nationwide Children's Hospital, our family would like to invite you to be apart of our Christmas Book Drive. If you would like to participate we ask that you donate a Christmas book or your favorite story to our drive. Families can gather together in the comfort of their hospital room and read a story together to celebrate Christmas and togetherness. If you are out of town and worried about shipping your book to us, we have made an Amazon Wishlist (click here) with lots of Christmas stories on it. You can shop and the book will be mailed straight to us. You can always go to your local bookstore and purchase your favorite story and get it to us. All the books will receive a stamp in the inside stating that it was donated in honor of Knox, Congenital Heart Defect Warrior, and donated to the CTICU and the step down unit of the Heart Center at Nationwide. We appreciate your interest in providing a little Christmas cheer to children with heart problems like Knox while they are in the hospital. We still can't thank Nationwide Children's Hospital enough for all the did for our little guy and our family, and we will continue to support them however we can!